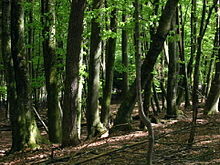 Modern forestry generally embraces a broad range of concerns, in what is known as multiple-use management, including the provision of timber, fuel wood, wildlife habitat, natural water quality management, recreation, landscape and community protection, employment, aesthetically appealing landscapes, biodiversity management, watershed management, erosion control, and preserving forests as " sinks" for atmospheric carbon dioxide. A practitioner of forestry is known as a forester. Other common terms are: a verderer, or a silviculturalist. Silviculture is narrower than forestry, being concerned only with forest plants, but is often used synonymously with forestry. Forest ecosystems have come to be seen as the most important component of the biosphere,  and forestry has emerged as a vital applied science, craft, and technology. Similar sustainable formal forestry practices were developed by the Visigoths in the 7th century when, faced with the ever-increasing shortage of wood, they instituted a code concerned with the preservation of oak and pine forests. The use and management of many forest resources has a long history in China as well, dating back to the Han dynasty and taking place under the landowning gentry. A similar approach was used in Japan. It was also later written about by the Ming dynasty Chinese scholar Xu Guangqi (1562–1633). In Europe, land usage rights in medieval and early modern times allowed different users to access forests and pastures. Plant litter and resin extraction were important, as pitch (resin) was essential for the caulking of ships, falking and hunting rights, firewood and building, timber gathering in wood pastures, and for grazing animals in forests. The notion of " commons" (German "Allmende") refers to the underlying traditional legal term of common land. The idea of enclosed private property came about during modern times. However, most hunting rights were retained by members of the nobility which preserved the right of the nobility to access and use common land for recreation, like fox hunting. Forest management also flourished in the German states in the 14th century, e.g. in Nuremberg,  and in 16th-century Japan. Typically, a forest was divided into specific sections and mapped; the harvest of timber was planned with an eye to regeneration. As timber rafting allowed for connecting large continental forests, as in south western Germany, via Main, Neckar, Danube and Rhine with the coastal cities and states, early modern forestry and remote trading were closely connected. Large firs in the black forest were called „Holländer“, as they were traded to the Dutch ship yards. Large timber rafts on the Rhine were 200 to 400m in length, 40m in width and consisted of several thousand logs. The crew consisted of 400 to 500 men, including shelter, bakeries, ovens and livestock stables. Timber rafting infrastructure allowed for large interconnected networks all over continental Europe and is still of importance in Finland. The practice of establishing tree plantations in the British Isles was promoted by John Evelyn, though it had already acquired some popularity. Louis XIV's minister Jean-Baptiste Colbert's oak Forest of Tronçais, planted for the future use of the French Navy, matured as expected in the mid-19th century: "Colbert had thought of everything except the steamship," Fernand Braudel observed. In parallel, schools of forestry were established beginning in the late 18th century in Hesse, Russia, Austria-Hungary, Sweden, France and elsewhere in Europe. Forestry mechanization was always in close connection to metal working and the development of mechanical tools to cut and transport timber to its destination. Rafting belongs to the earliest means of transport. Steel saws came up in the 15th century. The 19th century widely increased the availability of steel for whipsaws and introduced Forest railways and railways in general for transport and as forestry customer. Further human induced changes, however, came since World War II, respectively in line with the "1950s syndrome". The first portable chainsaw was invented in 1918 in Canada, but large impact of mechanization in forestry started after World War II. Forestry harvesters are among the most recent developments. Although drones, planes, laser scanning, satellites and robots also play a part in forestry. Trees provide numerous environmental, social and economic benefits for people. In many regions the forest industry is of major ecological, economic, and social importance. Third-party certification systems that provide independent verification of sound forest stewardship and sustainable forestry have become commonplace in many areas since the 1990s. These certification systems developed as a response to criticism of some forestry practices, particularly deforestation in less-developed regions along with concerns over resource management in the developed world. Some certification systems[ which?] are criticized[ by whom?] for primarily acting as marketing tools and for lacking in their claimed independence. In Spain, the first forestry school was the Forest Engineering School of Madrid ( Escuela Técnica Superior de Ingenieros de Montes), founded in 1844. ^ Sample, V. A.; Bixler, R. P.; McDonough, M. H.; Bullard, S. H.; Snieckus, M. M. (July 16, 2015). "The Promise and Performance of Forestry Education in the United States: Results of a Survey of Forestry Employers, Graduates, and Educators". Journal of Forestry. 113 (6): 528–537. doi: 10.5849/jof.14-122.